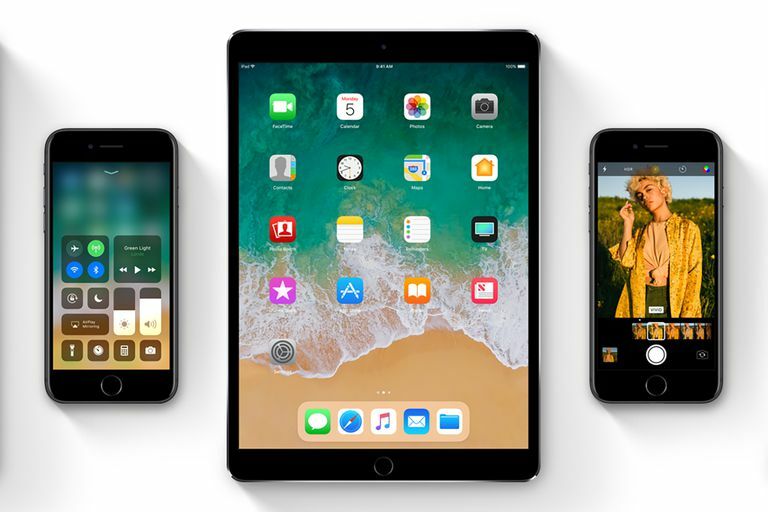 Whether you have an iPhone, iPad, or iPod touch, there are hundreds of improvements coming to your device when you install iOS 11. If you own an iPad, iOS 11 is especially important. Many of the biggest changes introduced with this version of the iOS are designed to make the iPad an even-more-powerful productivity tool, maybe one that can even replace a laptop. More than any other device, the iPad gets the biggest improvements from iOS 11. Along with the other features mentioned in this article, the iPad is getting enough improvements that it could now be a real replacement for a laptop for many people. The iPad in iOS 11 has improved multitasking, a dock for storing and launching commonly-used apps, drag and drop of content between apps, and an app, called Files that manages files like on a Mac or Windows computer. Even cooler are productivity features like a document-scanning feature built into the Camera app and the ability to use the Apple Pencil as a tool to write on virtually any kind of document — add handwritten notes to a text document, convert written notes to text, draw on photos or maps, and much more. Expect to hear about more people ditching laptops in favor of iPads thanks to iOS 11. Augmented Reality — a feature that lets you place digital objects into real-world scenes and interact with them — has huge potential to change the world and it arrives in iOS 11. AR, as it's also known, isn't built into any of the apps that come with iOS 11. Instead, the technology is part of the OS, meaning that developers can use it to create their apps. So, expect to start seeing a lot of apps in the App Store that tout their ability to overlay digital objects and live data onto the real world. Good examples could include games like Pokemon Go or an app that lets you hold up your phone's camera to a restaurant's wine list to see real-time ratings for each wine from the app's users. Venmo, a platform that lets you pay your friends for shared expenses like rent, bills, and to split the cost of dinner is used by millions of people. Apple is bringing Venmo-like features to the iPhone with iOS 11. Combine Apple Pay and Apple's free texting app, Messages, and you get a great peer-to-peer payments system. Just go into a Messages conversation and create a message that includes the amount of money you want to send. Authorize the transfer with Touch ID or Face ID and the money is withdrawn from your linked Apple Pay account and sent to your friend. The money is stored in an Apple Pay Cash account (also a new feature) for later use in purchases or deposits. AirPlay, Apple's technology for streaming audio and video from an iOS device (or Mac) to compatible speakers and other accessories, has long been a powerful feature of the iOS. In iOS 11, the next-generation AirPlay 2 takes things up a notch. Instead of streaming to a single device, AirPlay 2 can detect all AirPlay-compatible devices in your home or office and combine them into a single audio system. Wireless speaker maker Sonos offers a similar feature, but you have to buy its somewhat pricey hardware to get it. With AirPlay 2, you can stream music to any single compatible device or to multiple devices simultaneously. Think about holding a party where every room has the same music playing or creating a surround-sound experience in a room dedicated to music. The iPhone is the world's most widely used camera, so it makes sense that Apple is constantly improving the photo features of the device. In iOS 11, there are tons of subtle improvements to photography features. From new photo filters to improved skin-tone colors, still photos will look better than ever. Apple's animated Live Photo technology is smarter, too. Live Photos can now run on endless loops, have a bounce (automatic reverse) effect added, or even capture long-exposure images. Of particular interest to anyone who takes a lot of photos or videos and needs to conserve storage space are two new file formats Apple is introducing with iOS 11. HEIF (High Efficiency Image Format) and HEVC (High Efficiency Video Coding) will make images and videos up to 50% smaller with no reduction in quality. Every new release of the iOS makes Siri smarter. That's certainly true of iOS 11. One of the smarter new features is Siri's ability to translate from one language to another. Ask Siri in English how to speak a phrase in another language (Chinese, French, German, Italian, and Spanish are supported first) and it will translate the phrase for you. Siri's voice is also improved so that now it sounds more like a person and less like a human-computer hybrid. With better phrasing and emphasis on words and phrases, interactions with Siri should feel more natural and easier to understand. Control Center is a great way to quickly access some of the most-used features of the iOS, including music controls, and turning on and off things like Wi-Fi and Airplane Mode and Rotation Lock. With iOS 11, Control Center gets a brand new look and becomes much more powerful. First off, Control Center now supports 3D Touch (on devices that offer it), meaning that many more controls can be packed into a single icon. Even better, though, is that you can now customize the controls available in Control Center. You'll be able to remove the ones you never use, add in the ones that will make you more efficient, and let Control Center become a shortcut to all the features you need. A key new safety feature in iOS 11 is Do Not Disturb While Driving. Do Not Disturb, which has been part of the iOS for years, lets you set your iPhone to ignore all incoming calls and texts so you can focus (or sleep!) without interruption. This feature extends the idea for use while you drive. With Do Not Disturb While Driving enabled, calls or texts that come in while you're behind the wheel no longer light up the screen and tempt you to look. There are emergency override settings, of course, but anything that reduces distracted driving and helps drivers focus on the road will bring tremendous benefits. No one likes to run out of storage space (especially on iOS devices, since you can't upgrade their memory). One way to free up space is to delete apps, but doing that means you lose all the settings and data related to that app. Not in iOS 11. The new version of OS includes a feature called App Offloading. This lets you delete the app itself, while saving data and settings from the app on your device. With it, you can save the things you wouldn't be able to get back and then delete the app to free up space. Decide you want to app back later? Just redownload it from the App Store and all of your data and settings are there waiting for you. There's even a setting to automatically offload apps that you haven't used recently to intelligently increase your available storage. It used to be that the only way to make a recording of what was happening on your iOS devices' screen was either to hook it up to a Mac and do the recording there or jailbreak it. That changes in iOS 11. The OS adds a built-in feature for recording your device's screen. This is great if you want to record and share a game session, but also super helpful if you develop apps, websites, or other digital content and want to share in-progress versions of your work. You can add a shortcut for the feature in the new Control Center and videos are saved in the new, smaller HEVC format to your Photos app. We've all had the experience of going to a friend's house (or having a friend come over) and wanting to get on their Wi-Fi network, only to have them take your device so they can enter a 20-character password (we're definitely guilty of this). In iOS 11, that ends. If another device running iOS 11 or higher tries to connect to your network, you'll get a notification on your iOS 11 device that this is happening. Tap the Send Password button and your Wi-Fi password will be automatically filled in on your friend's device. Forget typing in long passwords. Now, getting visitors on your network is as simple as tapping a button. Upgrading from one iOS device to another is pretty easy, but if you've got a lot of data to move, it can take a while. That process gets a lot faster in iOS 11. Simply put your old device into Automatic Setup mode and use the camera on the new device to capture the image being displayed on the old device. When it locks on, many of your personal settings, preferences, and iCloud Keychain passwords are automatically imported to the new device. This won't transfer all of your data — photos, offline music, apps, and other content will still need to be transferred separately — but it will make the setup of and transition to new devices that much quicker. The iCloud Keychain feature built into Safari saves your website passwords across all devices signed into your iCloud account so you don't have to remember them. Super helpful, but it only works on the web. If you need to sign into an app on a new device, you still need to remember your login. Not with iOS 11. In iOS 11, iCloud Keychain now supports apps, too (developers will have to add support for it to their apps). Now, sign into an app once and save the password. Then that login will be available to you on every other device signed into your iCloud. It's a small feature, but one that removes one of that little annoyance from life that we'll all be so glad to see go. The App Store gets a whole new look in iOS 11. In keeping with the redesign of the Music app ushered in with iOS 10, the new App Store design is heavy on big text, large images, and — for the first time — it separates games and apps into separate categories. That should make it easier to find the kind of app you're looking for without the other interfering. Beyond a new look, there are new features, too, including daily tips, tutorials, and other content that will help you discover useful new apps and get more out of the apps you already use.